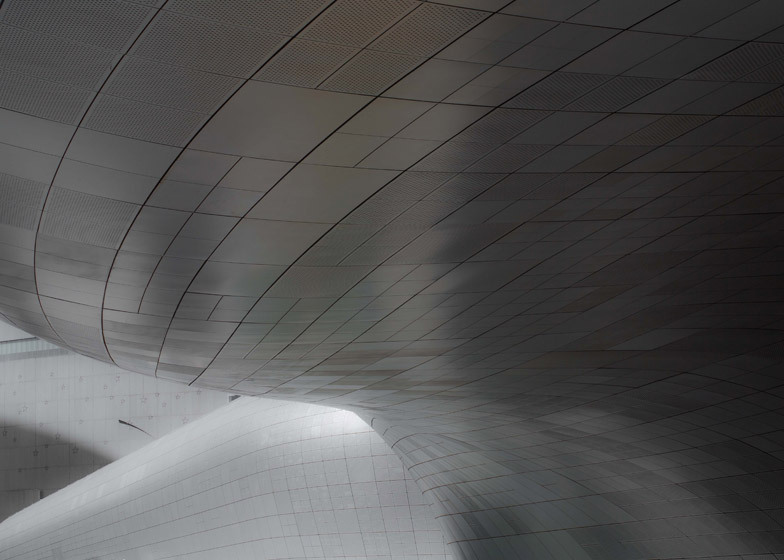 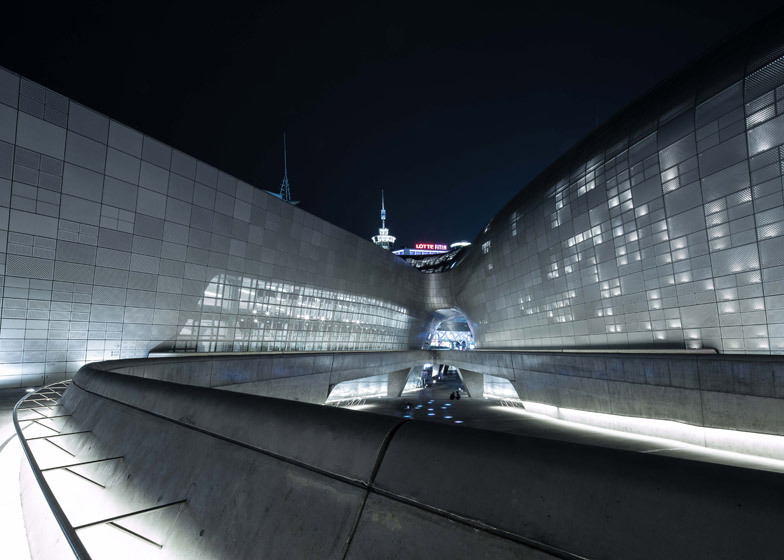 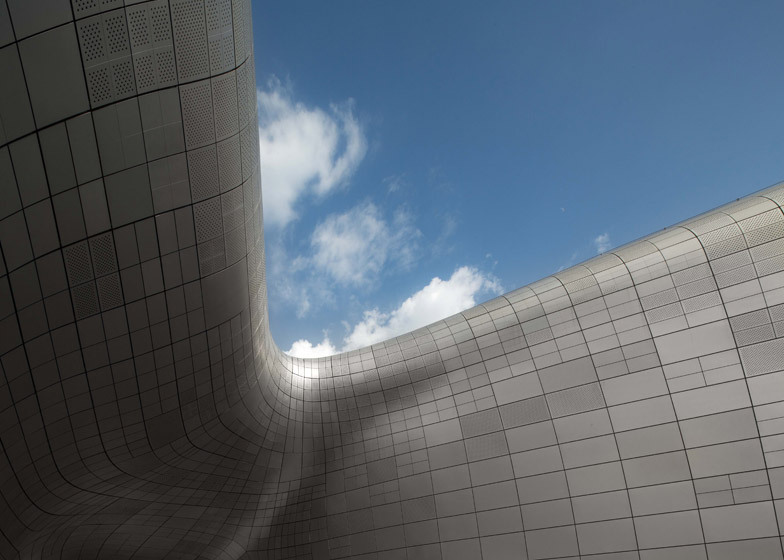 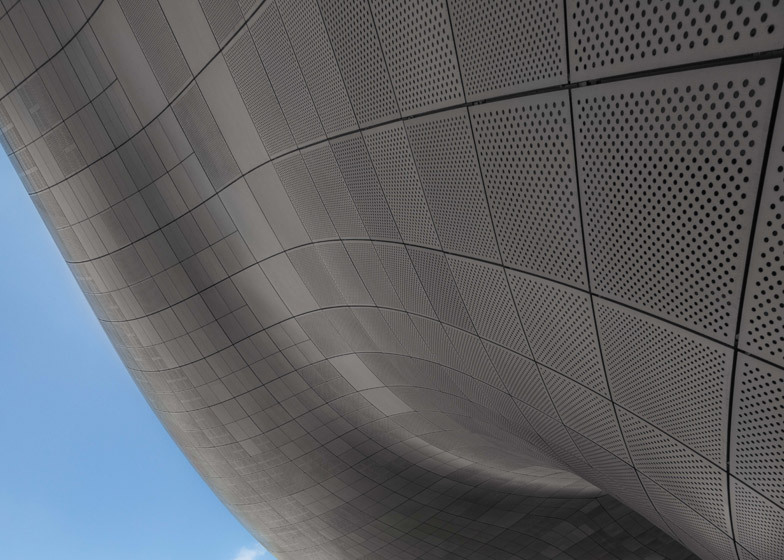 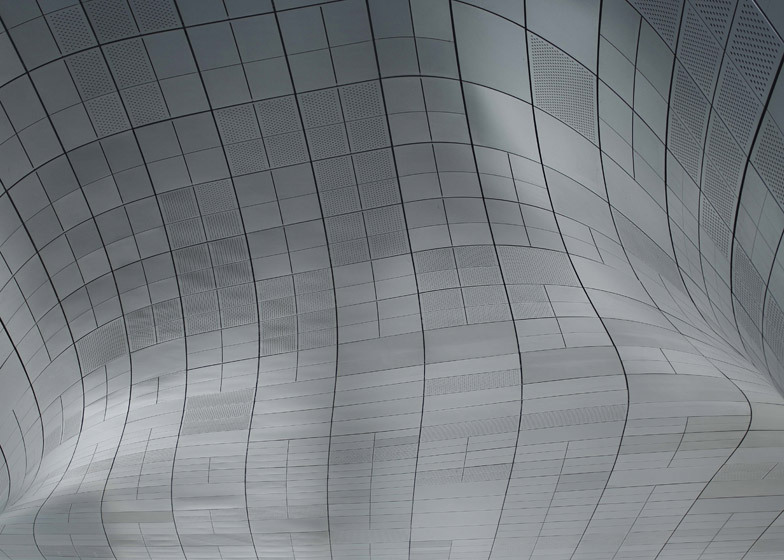 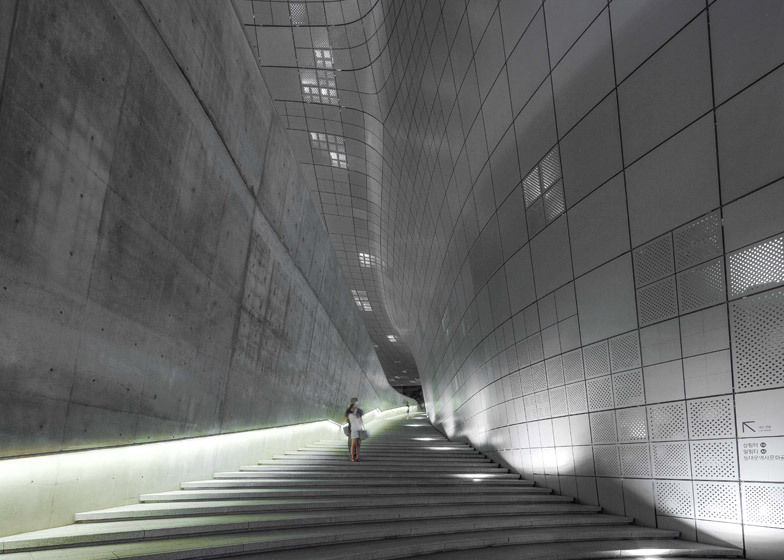 These new images by architecture photographer Edmon Leong show the undulating contours and glittering surfaces of Zaha Hadid's Dongdaemun Design Plaza complex in Seoul, South Korea (+ slideshow). 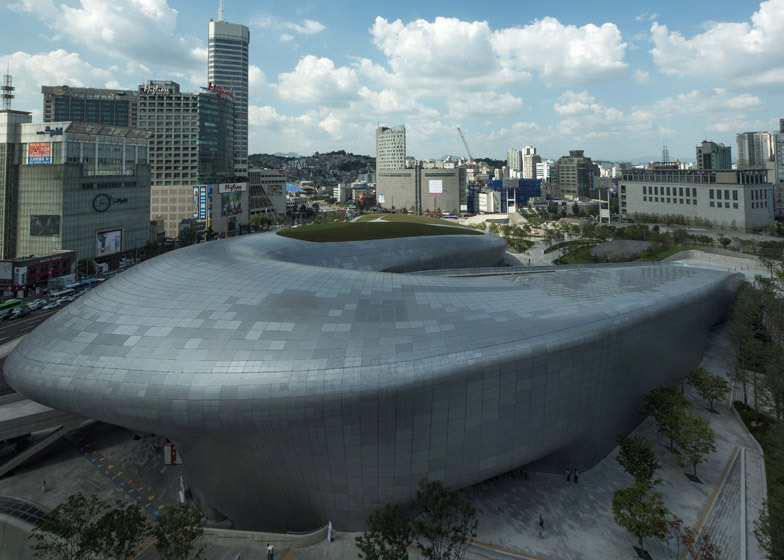 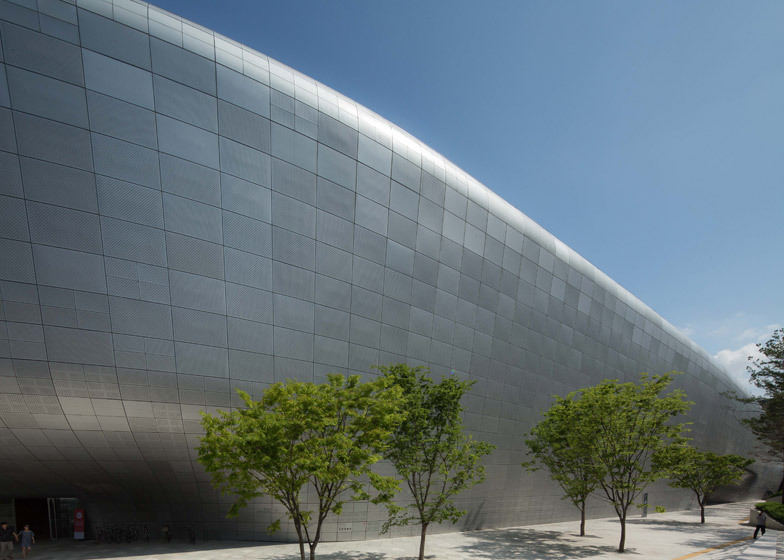 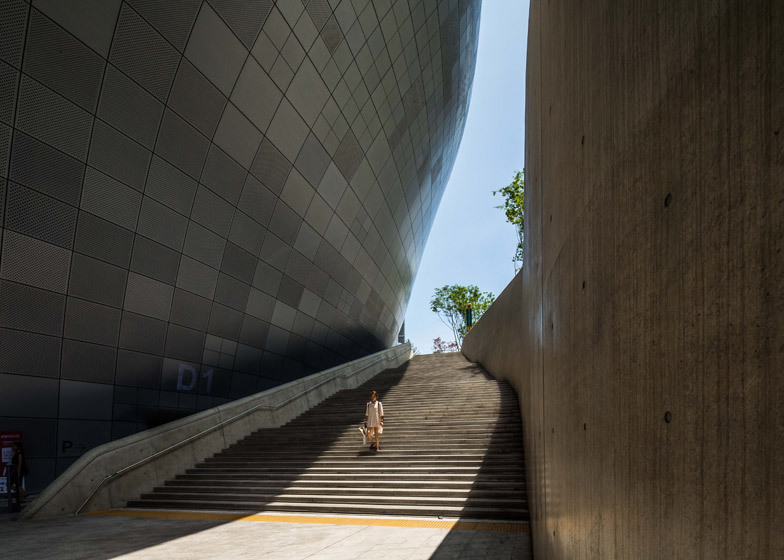 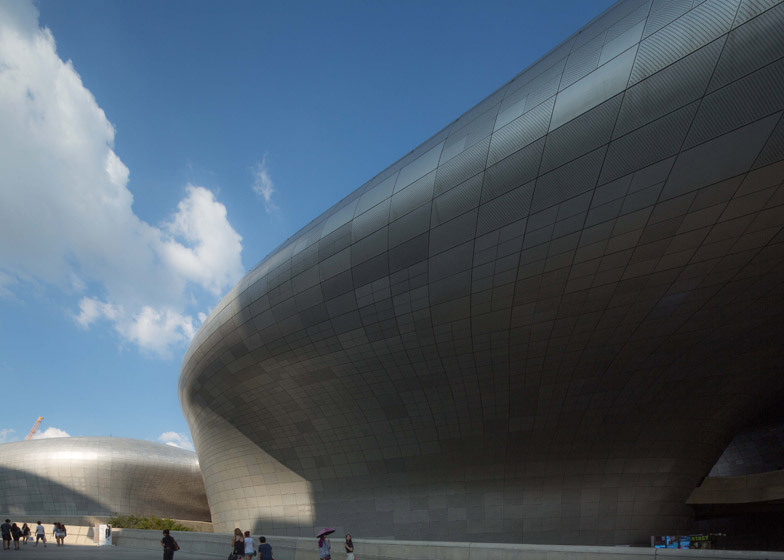 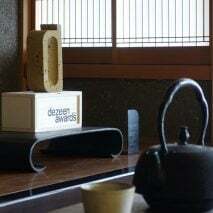 Completed in the spring, the 38,000-square-metre cultural complex is located at the heart of Seoul's 24-hour shopping district. 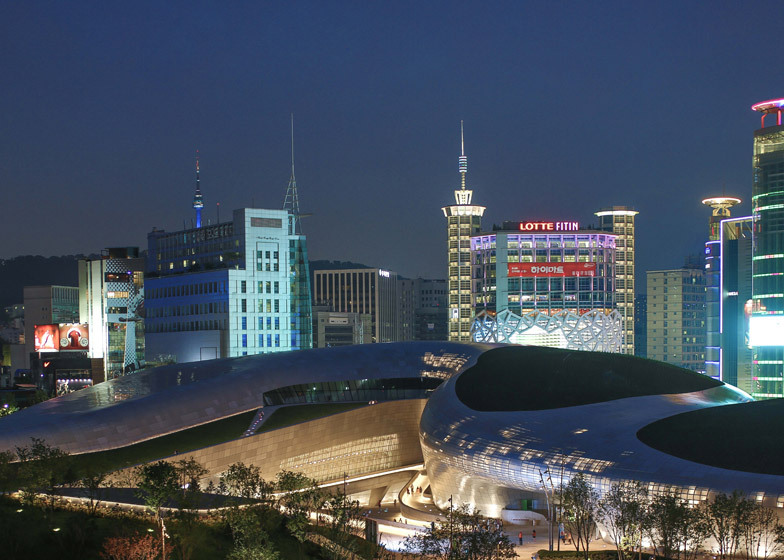 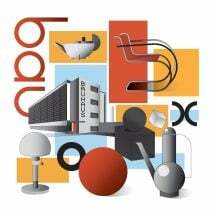 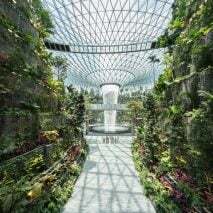 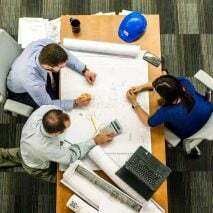 It encompasses an art, design and technology hub, an adjoining public plaza and a landscaped park. 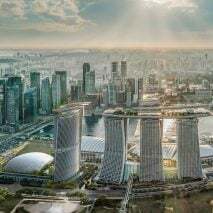 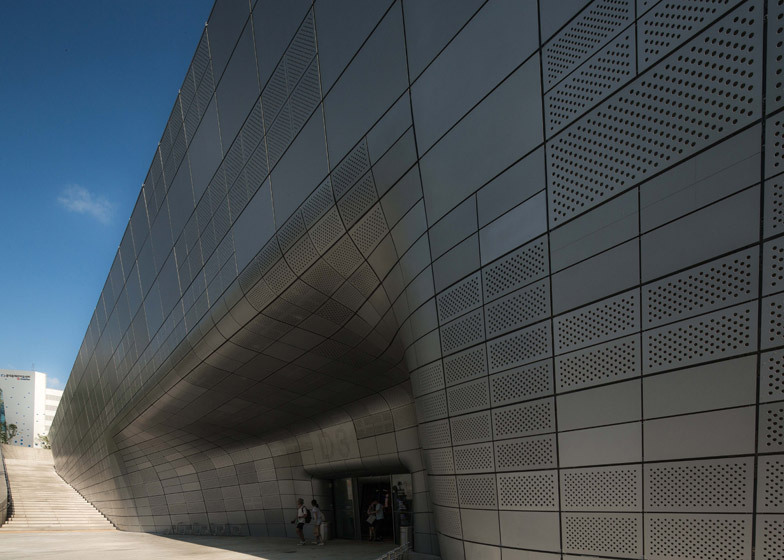 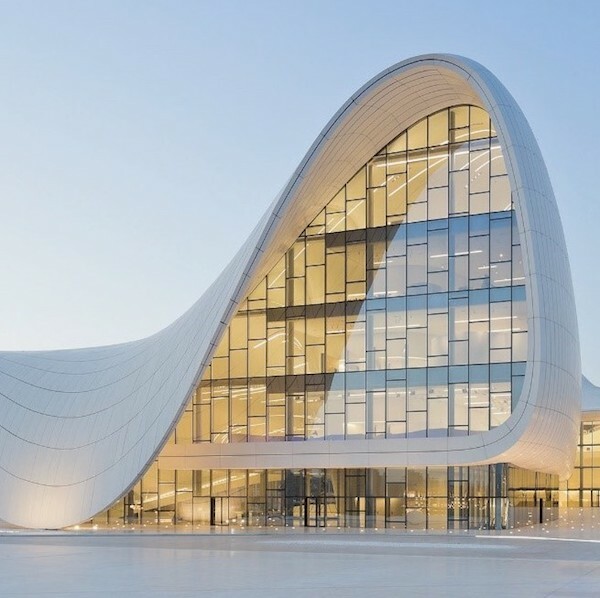 Zaha Hadid Architects designed a curvaceous aluminium facade that is speckled with minute holes and backlit by night, creating a twinkling effect described by the design team as a "a field of pixilation and perforation patterns". 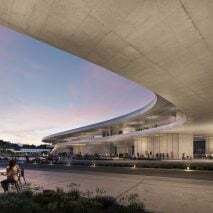 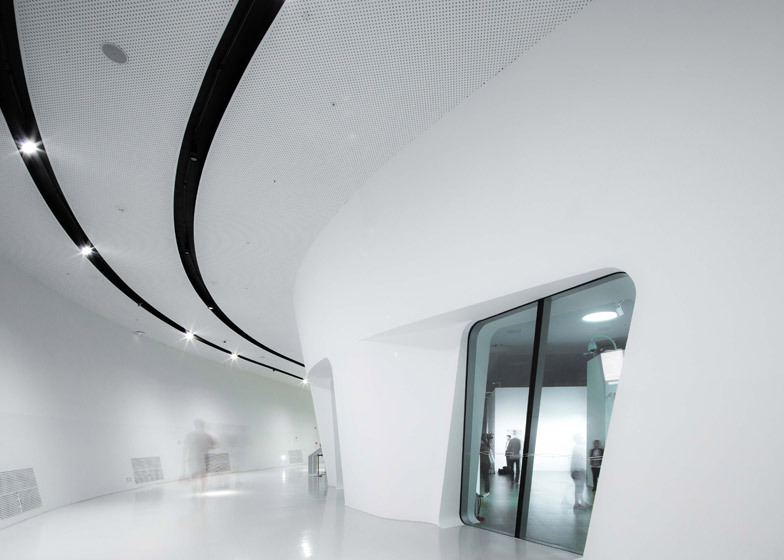 Edmon Leong, who regularly photographs Hadid's projects, says the building is one of the largest he's seen by the London-based architect. 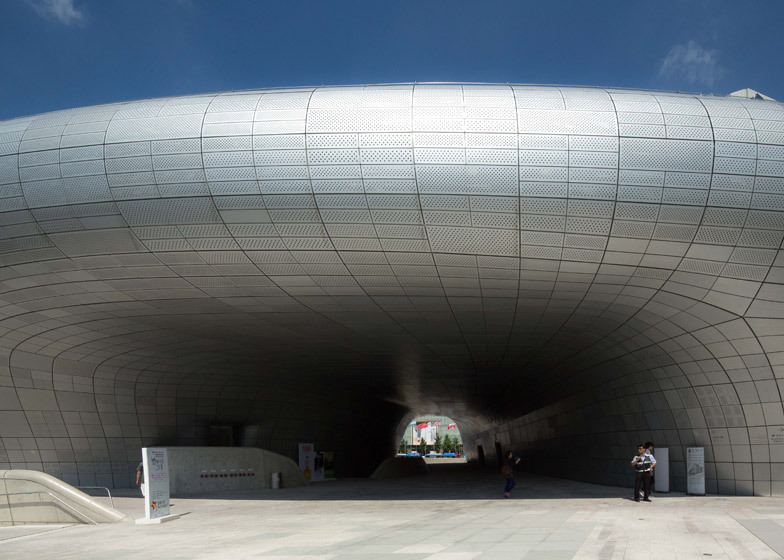 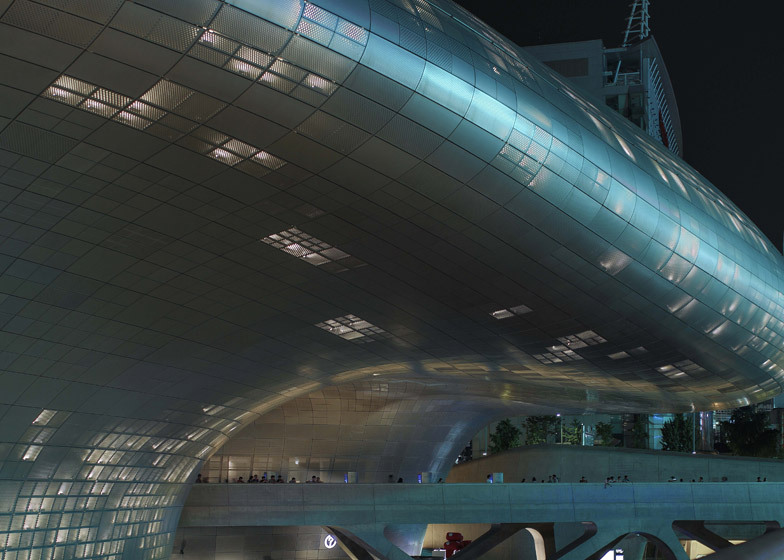 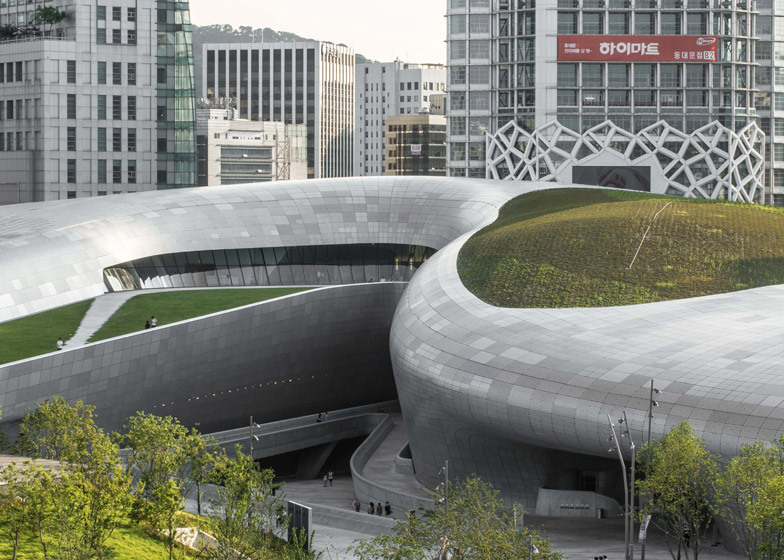 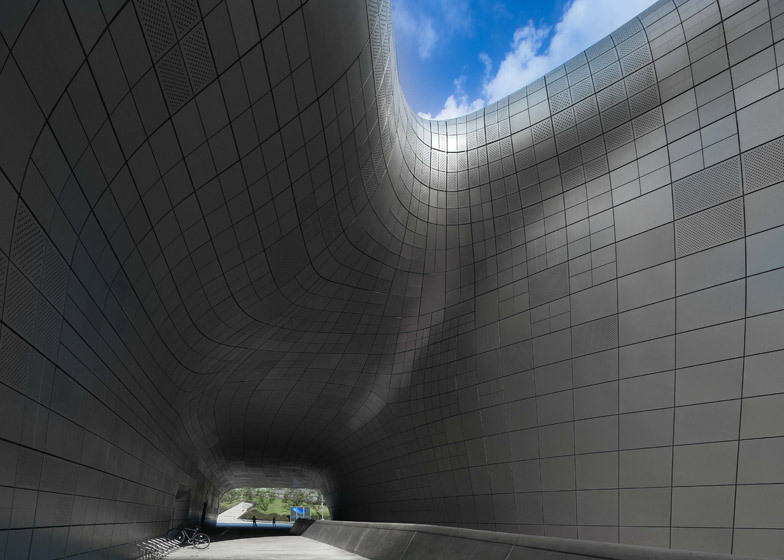 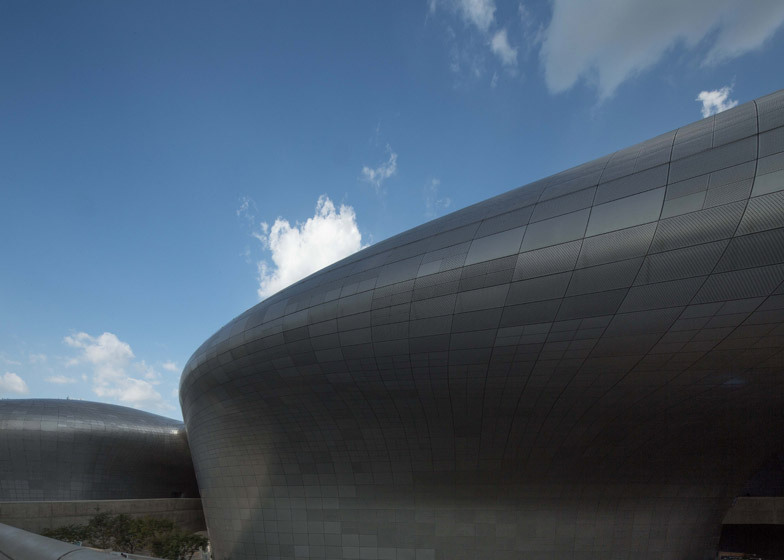 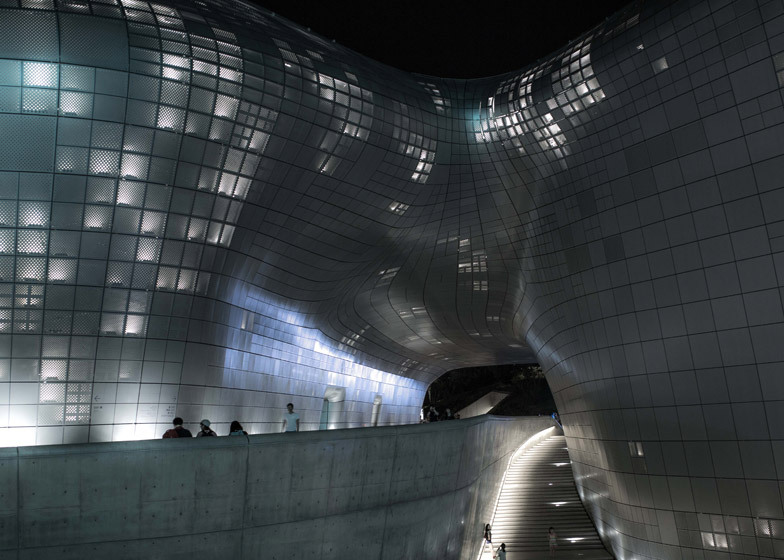 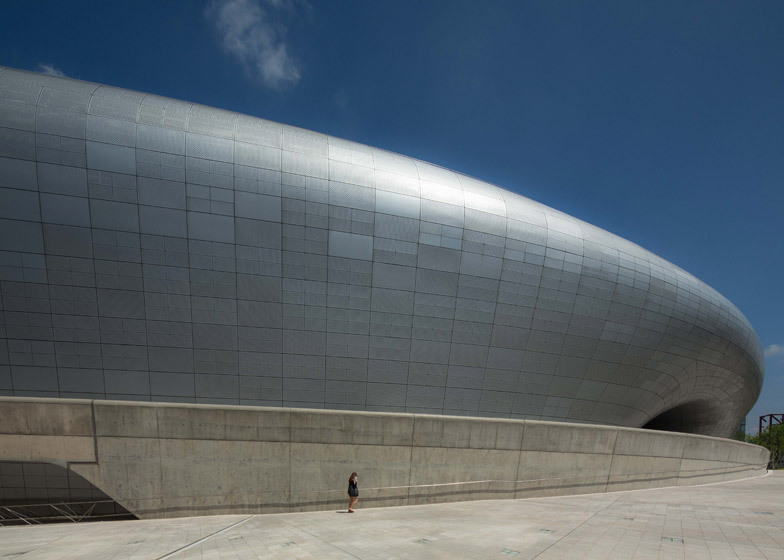 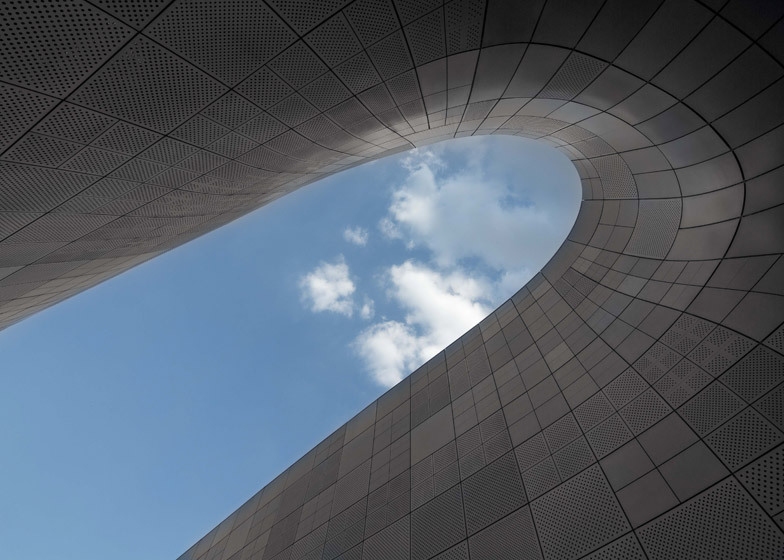 "It looks like the Starship Enterprise just landed in Seoul," he told Dezeen. 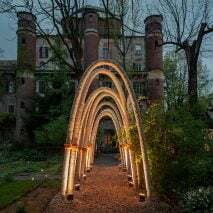 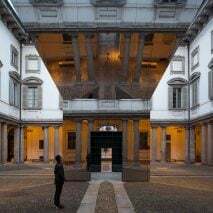 "It really stands out against the surrounding buildings, which are extremely old and weathered. 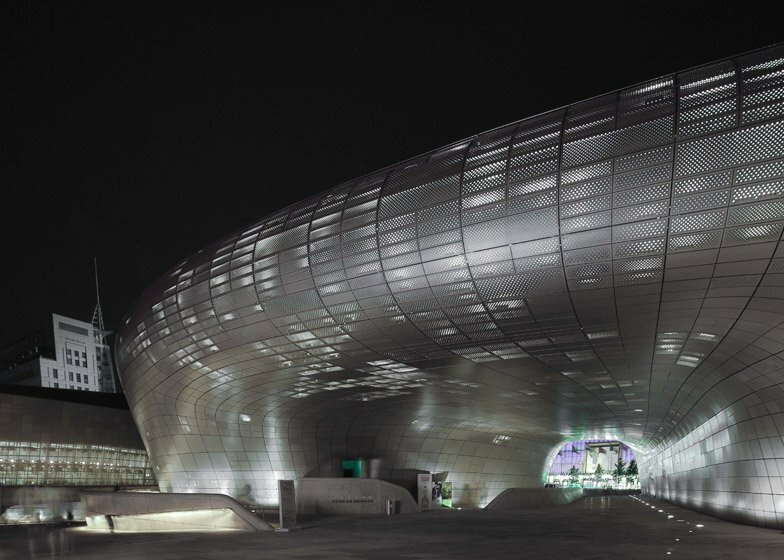 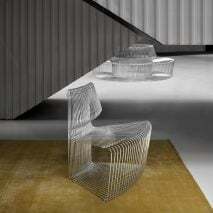 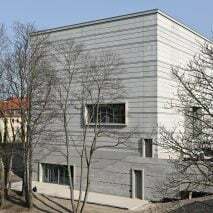 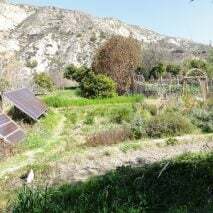 No other modern structure can been seen in the area." 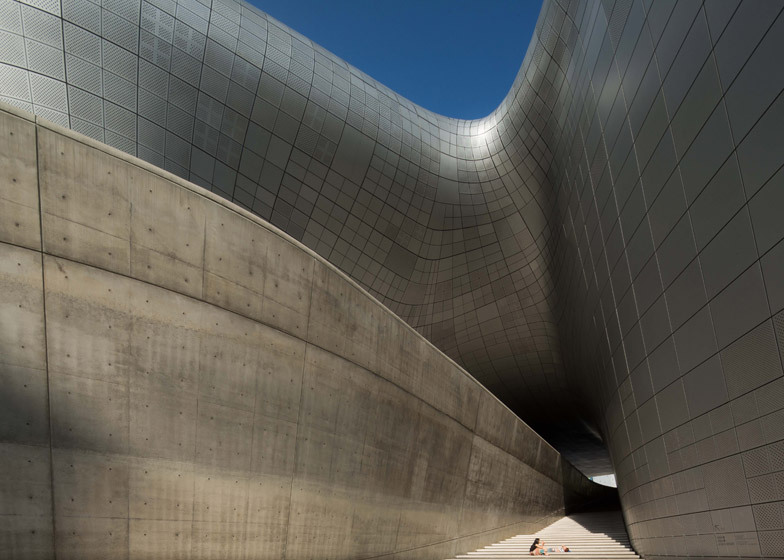 The photographer said the project attracts a mixed response from locals and tourists, with some taking selfies in front of the building. 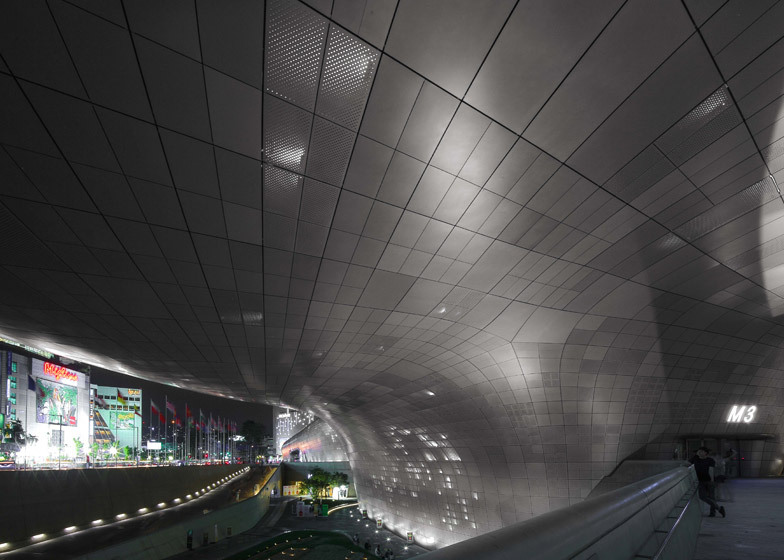 "I overheard comments like 'this is amazing' and 'it looks like something from outer space'. 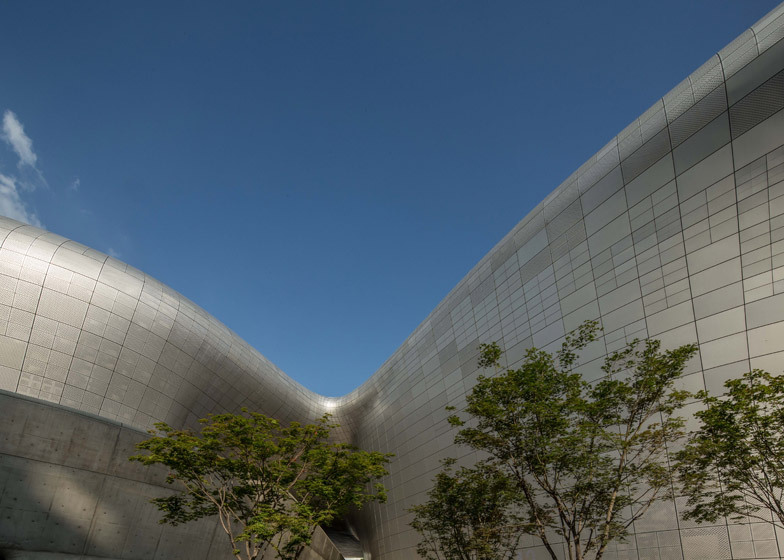 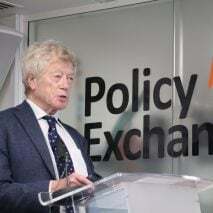 The words 'ugly' and 'out of context' were also expressed, and at times I felt like I needed to defend the work," he said. 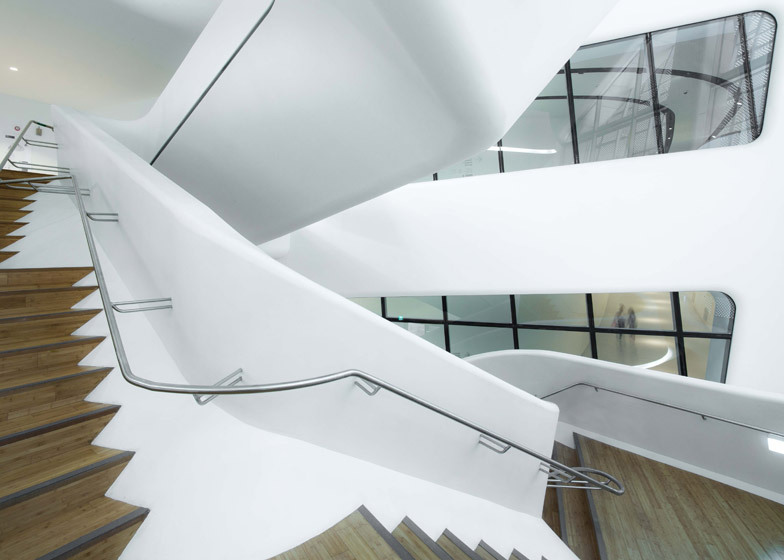 The eight-storey complex hides half of its volume below ground level. 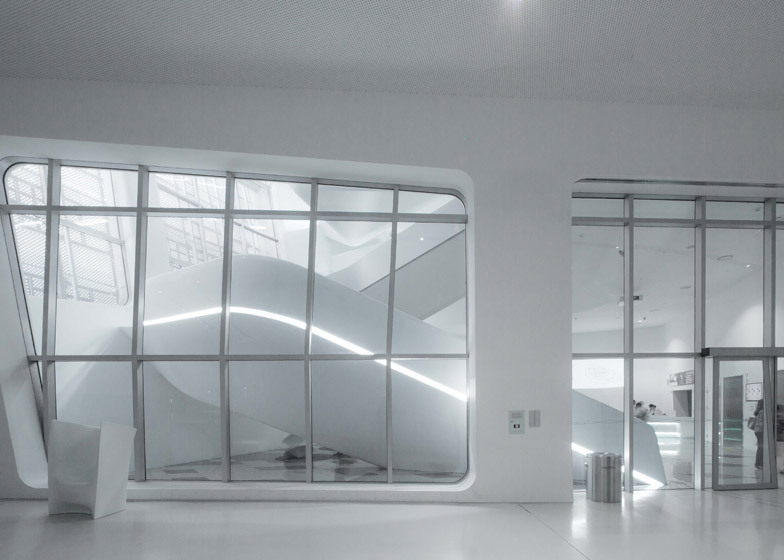 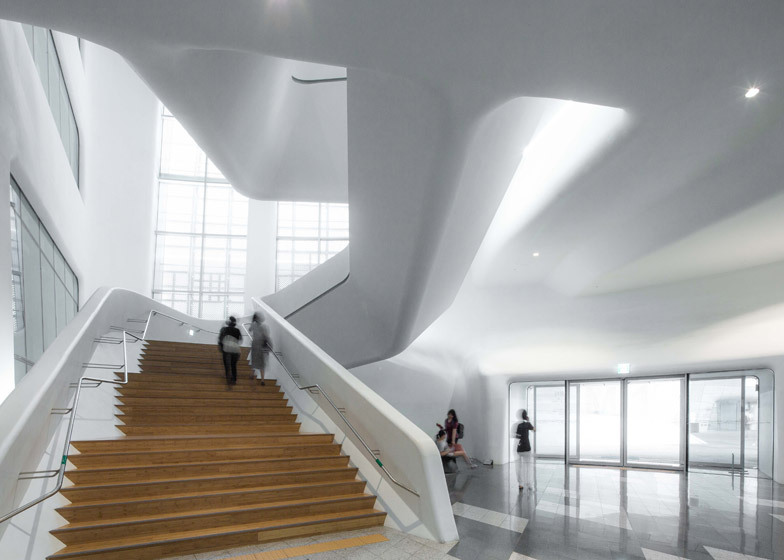 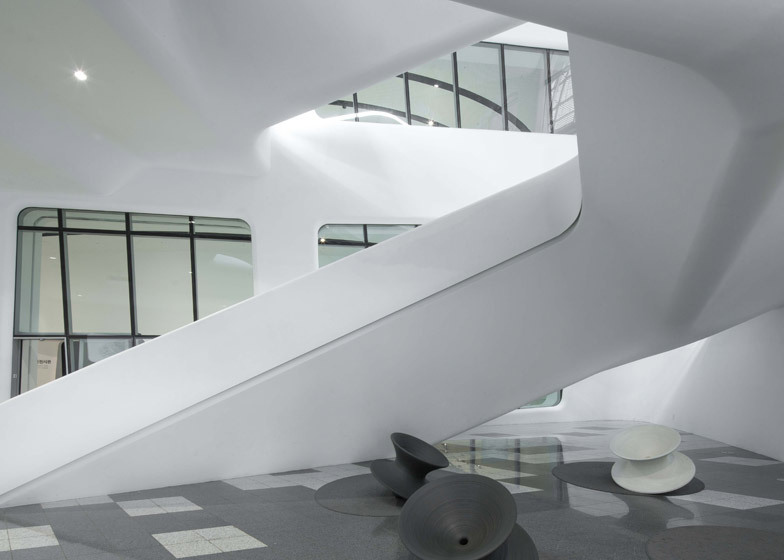 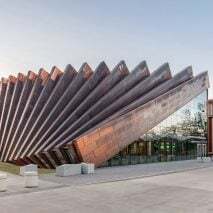 The interior, which Leong describes as "signature Zaha Hadid, with layers of white curves", accommodates exhibition galleries, a design museum, and a library and education centre.